The four remaining functioning satellite radio tags were still transmitting information up to Christmas Day or thereabouts – but there have been no signals since then. This is of course unfortunate, but also one of the realities sometimes of biological field studies using high-tech equipment like this! It’s possible that there has been some software/electronic signal transmission glitch along the information chain – all four radios seem to have stopped in the same week in late December. 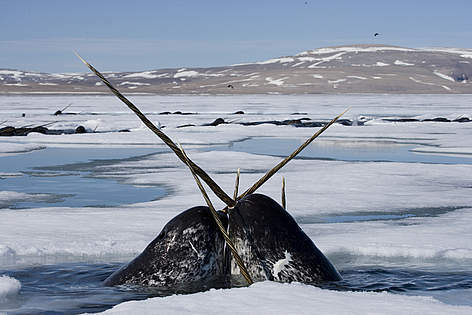 But its also conceivable that the narwhals were having to push up some sea-ice in their wintering-feeding areas, and that could have caused the transmitter units mounted along their dorsal ridge to break free, and the just fall to the depths of Baffin Bay-Davis Strait. On the bright side though, we did manage to establish the migratory path the whales took from August to December, and we showed that this year’s main wintering-feeding areas were quite a bit further south for most of the tagged animals, than in 2012 and some previous years. All of this information is really vital to understanding where narwhal need to be to do their natural ‘thing’ – in the face of anticipated upcoming decisions about planned future seismic explosions and surveys/drilling for oil and gas deposits, as well as increased shipping and commercial fishing pressures in and around Baffin Bay and northern Davis Strait. WWF-Canada will be monitoring this situation closely in the coming months, and will post any significant news updates on this narwhal tracker page – as well as news if the radios suddenly start transmitting again (this has happened in the past with other species! ).